In this post, we have compared the top 5 best WordPress page builder plugins in detail. You can select any of them as per your requirements. It is an excellent page builder plugin that has taken the industry with a storm. The Elementor will access a fully original and unique interface for developing custom posts, pages, and many other things. There is no need for any HTML or PHP related knowledge for creating pages. You will become successful in completing all the things with the help of its friendly user interface. It is action-packed with a page-building functionality that you won’t find in the majority of plugins available for the WordPress. Other than that, there are tons of pre-made page templates that are allowed to get modified and imported. While testing this plugin, we found it has more than 35 free templates. It is one of the best page builder plugins that also equipped with a custom page template with the name of Elementor Canvas. This blank page template allows the users to create a page without utilizing the elements that come from the present WordPress theme. It consists of elements like sidebar, header, footer, etc. In simple words, we can say that this plugin allows users to create, tweak and adjust pages in a completely free manner. If you are looking for an extremely quick and easy to use the plugin, then finding a better option than WP Page Builder will be a very difficult task. The users can enjoy a completely newer site building experience with a unique set of features available in this exciting plugin. It equips with a 100% drag and drop system that is compatible with all the themes. Missing the name of this one in any list of best WordPress page builder plugins will be impossible. It gives you greater flexibility while developing the layouts for the web pages so that rows and columns can be added. Furthermore, you can find successfully build pages that are fully responsive on the mobile. Divi Builder is an extraordinary plugin that is compatible with all types of WordPress themes. It is created by the Elegant Themes who considered as one of the premier shops for WordPress themes. It let the users enter the wireframe mode and manipulate lots of things like row, columns, section and page’s structure directly. We found its design pretty clean and helpful for the newbies. It is a drag and drop page plugin that works with both posts and pages quite effortlessly irrespective of its type. The users are allowed to add custom layouts using many content modules. There is columns and rows layout system followed by this plugin that ensures you can add infinite sections or rows in your page followed by adding custom content. On top of that, the Divi Builder plugin comes with a back-end builder tool that let the users switch between tabs for checking the back-end view. The readers who are looking for a flexible and solid visual editor plugin to create pages, then it is best to go with WPBakery page builder for WordPress as it comes with all the necessary features. The drag and drop editor available in this plugin allows the users to develop complex layouts. This massive plugin was formerly known as Visual Composer and equipped with many handy tools like visual back end editing and front end editing. The thing that makes it unique from other plugin is the skin builder feature that let the users create global modifications to their site. They can set color templates and even adjust them according to the width of the mobile screen along with grid spacing and lots of other features. Furthermore, all the modifications applied in the skin builder saved automatically in a static CSS file so that they can be added on a later stage. Beaver Builder is one of those page builders that have become a favorite option of developers as well as designers. It may not be one of the cheapest options in this list, but you won’t disappoint after seeing its ease of use and effective features. We find its user interface very intuitive that make it a perfect option for the beginners. That’s not all; it is one of the most amazing WordPress Page builder plugins that equip with an interesting library of page templates. Also, there are a great number of support options available through which the users can connect with the representatives. Even the cheapest plan of this plugin can use on an unlimited number of sites. The users can save modules and rows so that they can use them later from any part of the world. On top of that, the complete front-end editor let the users work on the page’s final version effectively. It is an ideal plugin for individuals who are looking to manage sites on their own by developing great-looking content. Also Check our post – How to add Contact Form to your WordPress website? As you can see all the plugins that we have mentioned in this article has something different to offer for the developers. You will get enough features in each one for building incredible website layouts. 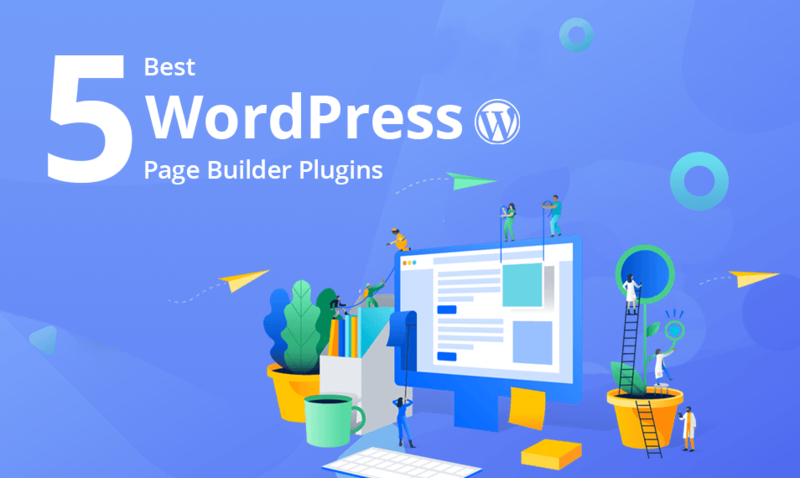 It is important that you identify your needs and then choose one of these 5 best WordPress page builder plugins according to them. Do you believe that the name of your favorite plugin is missing from this list? If yes, then tell us in the comment section. Also, don’t forget to tell about your experiences with the chosen plugin.